View looking southwest at the northern face of the granary that dates to the reign of Hadrian (AD 117–138) and still stands to its original height. The building measures 213 x 105 ft. [65 x 32 m] and is built out of well–dressed local limestone. Two of the eight entrances to the long storage rooms are visible. At the far, west, end of the structure one of the two rooms for administrative officials and/or guards is visible. 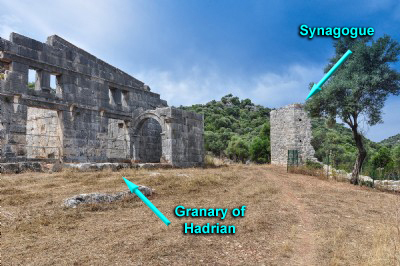 The structure to the right of the center of the image, in the distance, at the northwestern corner of the granary, is the well–preserved apse of the recently discovered "synagogue."